Since it is not possible to prevent difficulties from ever arising, we need to develop a strong mind in order to weather life’s challenges. A strong mind is a flexible mind, that is able to adapt to changing circumstances just like a tree that bends with the wind. A strong mind is also a confident mind that knows that whatever life throws at us, we can cope with it and even grow through that experience. Buddha’s teachings provide us with invaluable methods to develop inner strength, resilience and true confidence. At this public talk Kadam Morten will share some of these methods and show us how we can easily put them in to practice in our busy and challenging daily lives. Kadam Morten Clausen is the Eastern US National Spiritual Director of the New Kadampa Tradition and Resident Teacher at the Kadampa Meditation Center New York City. 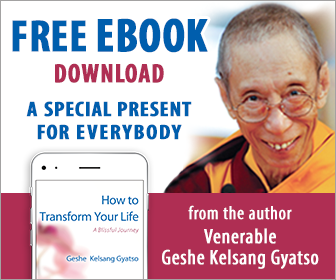 For over 30 years he has been a close disciple of Venerable Geshe Kelsang Gyatso. Kadam Morten met his teacher, Geshe Kelsang, while attending university in England. He taught widely throughout the UK and helped develop many Kadampa Centers in England. Kadam Morten has been teaching in the US for more than 20 years and has established centers throughout the New York area, as well as Washington DC, Virginia, and Puerto Rico. In addition to his local teaching responsibilities, he teaches and guides retreats regularly throughout the United States and Europe.